Yu-Gi-Oh! TCG Event Coverage » Sunday’s Top 4 Dragon Duelists at YCS Pasadena! Home > 2018/11 - Pasadena, CA, Yu-Gi-Oh! 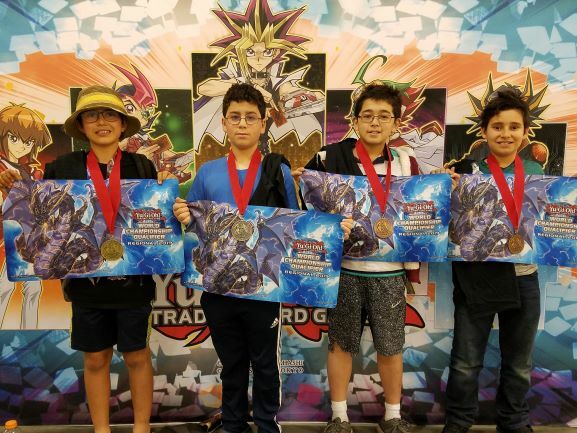 Championship Series	> Sunday’s Top 4 Dragon Duelists at YCS Pasadena! Sunday’s Top 4 Dragon Duelists at YCS Pasadena! Take a look at the Top 4 Dragon Duelists for Sunday’s Dragon Duel event at YCS Pasadena! Here are Sunday’s Dragon Duel Top 4! From left to right, it’s Ben Hernandez (1st), Daniel Schwartz (2nd), Christian Shuck (3rd), and Isaiah Burdette (4th). Congratulations Dragon Duelists! Ben will be facing Kenta Lee, yesterday’s Dragon Duel winner, in the playoffs!